IRELAND -- Four people were arrested this week following an investigation into a string of burglaries in Ireland. Leinenbach Tire and Ireland Car Credit, both in Ireland, were broken into earlier this month. The suspects allegedly stole cash, tools and other items. 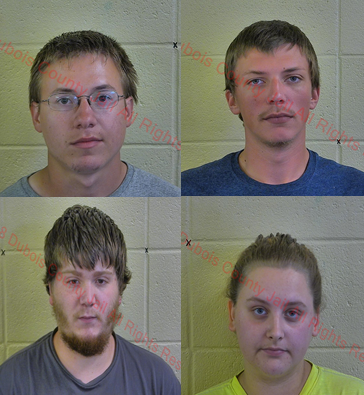 As a result of an investigation by the Dubois County Sheriff’s Department, four were arrested…. 20-year-old Clint Sadler, 20-year-old Caden Newland, 23-year-old Aaron Remeto and 20-year-old Brittany Woody. Sadler is charged with six felony counts of burglary, attempted burglary and theft along with some misdemeanor charges. Remeto faces 5 felony counts of burglary, attempted burglary, aiding in a burglary and theft.He also faces several misdemeanor charges. Newland and Woody are both charged with felony burglary and theft.